What do we mean when talking about local knowledge? Why is it important? Why is it different from expert knowledge? Can we use ICTs to rescue, revalue and position the local knowledge? How a process like this can empower a community? We had all this questions at the beginning and probably our answers are not complete or total. When we differentiate the local knowledge from others there is a politic view involved: is not only that people from the communities do not consider what they know to be important, is that researchers and academics tend to think they know all the important stuff and they are the ones how should teach people from communities on everything. Quebradas, Pérez Zeledón, Costa Rica. Quebradas is a rural community located at the Southern Pacific zone of Costa Rica. It has a very important river basin, that generates the drinking water for the 95 thousand inhabitants of the city of San Isidro del General. 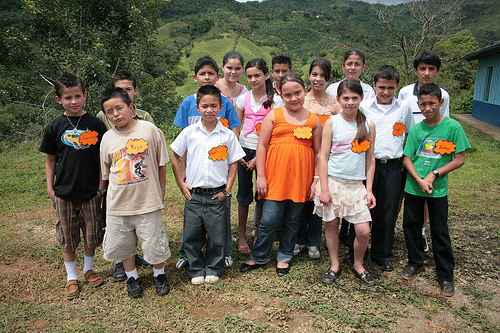 The community is part of the District of San Isidro, created in 1939. Its name means “Stream” and was given due to the high amount of rivers and streams in the area. Currently, and since 1983, FUDEBIOL works in the preservation of the river basin, supported by a volunteers program, and in partnership with the AyA. FUDEBIOL was our counterpart in this community, and they helped us to contact primary schools and to set the working team. We established relations with 3 different schools of the area: Quebradas, Quebradas Arriba and Morazán, and five children from each school joined us during the process. Moms and teachers organized themselves to join us during the capacity building workshops, for the kids can not leave the school during their normal schedule without someone in charge. What did we do here? Working with the kids in a 9 month process, we developed capacities in the use of digital cameras to rescue local images from the community. Along with the photography capacities, the kids learned how to conduct an interview and how to tell a story about the community based on testimonials from key actors that were interviewed.